Last minute winter holiday advertising ideas for Kelowna businesses | Locally owned and family operated sign company producing quality interior and exterior signage for Okanagan businesses. Last minute shoppers in Kelowna aren’t the only ones who are caught unprepared for the uber busy holiday season, we also see many local businesses who have failed to plan ahead for what is arguably the busiest time of the retail year. 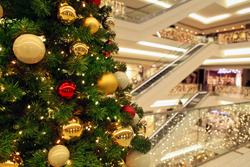 People come out in droves over the months of November and into December as they look to scoop up the latest and greatest deals, gifts and experiences for their loved ones. If you’re a local Kelowna business and you’re not looking so festive right now and need a Kelowna sign company, we’ve got some tips on why it’s actually a good idea for your bottom line to invest in some holiday cheer and spruce up your shop and business over the holidays! Nostalgia rules over the holidays and nothing tugs at the heart strings a.k.a the wallet strings more than a warmly decorated space. Festive lighting and music are all key to set the spending mood and coincidentally they partner perfectly with professionally designed and printed display stands. We can design and print wraps for your existing display hardware or create temporary displays that you can use at markets, fairs and tradeshows. Window displays are big business! That’s why companies like Bergdorf Goodman’s in NYC invest in full time window dressers because they are critical to their image. At Signcraft, we can design, print and install window wraps that will help you to draw the shopping traffic inside where you can further entice them with your custom printed displays and holiday ambience. This is the biggest retail time of the year you need to give Kelowna customers a reason to come through your doors and vinyl window wraps will do the trick! You never know why someone has never chosen to visit you in-store before, but you can be sure that advertising a great holiday sale or gift giving idea will change their minds. 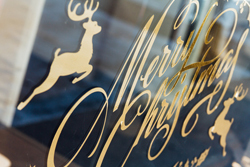 Use vinyl window wraps, and custom holiday signage to entice new shoppers to give you a try. Chances are your neighbour won’t be as flashy so this is your chance to really shine! This might be the perfect time of year to sell that thing that won’t sell any other time of the year. Let busy shoppers know exactly where they can get that thing by using wayfinding signage inside your shop. Wayfinding will direct time pressed shoppers right where they need to go. Have the best Kelowna signs and step it up a notch by making your cash/sales area easily discoverable as well. You don’t want sales to walk out the door because they couldn’t figure out where to pay or wait in line. We can discuss a wayfinding plan with you at your shop and come up with a plan that will help with the busy winter shopping rush. 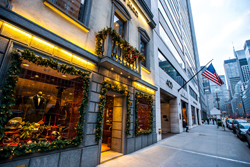 The aforementioned Bergdorf’s is famous for it’s Christmas window displays and people flock from all over the world just to snap a picture of them. David Hoey, the famed window dresser for the NYC department store, oversees a staff of 100 to pull it all off. Luckily, you can hire us and while it might not require traffic control, we can definitely improve your curb appeal and help to make you one of Kelowna’s holiday shopping destinations. We can deploy an entire marketing strategy to get those windows all prettied up for the holidays, so they sparkle and shine and bring paying customers through your doors. Are you a last minute sign shopper in the Okanagan area? Signcraft can help! If reading all of this got you in the decorating mood then reach out to us as soon as possible! Contact your local sign experts at SignCraft and we’ll see what we can do in a rush to get your shop in the holiday spirit to bring the shoppers inside out of the cold!